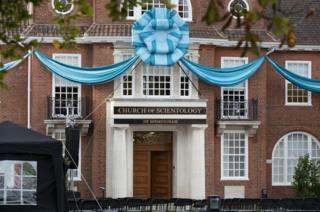 The Church of Scientology has opened a £4.2m HQ in Birmingham. Grade II listed Pitmaston House, in the Moseley suburb, was snapped up in 2007 by the group, which was founded by science fiction author L Ron Hubbard. There was a heavy security presence around the building during an opening ceremony, at which senior church figures gave speeches. A request for an interview about the new "Ideal Org", or headquarters, was turned down. The church claims the building, which is the second of its kind in the UK, will house a training centre and a chapel. A huge blue rosette and ribbons were draped across the front of the building ahead of the opening ceremony, while lighting and camera equipment could also be seen. Speeches were played back on two large screens erected on either side of the main entrance. Groups of protesters, including ex-church members, gathered outside during proceedings, according to the Birmingham Mail. Scientology offers believers a life improvement strategy it calls dianetics. People take courses of dianetics counselling, known as auditing, in the hope of ridding themselves of destructive influences from their current or past lives. Scientologists say it is a religion, but a string of defectors have accused it of being a dangerous cult. They allege physical and emotional abuse, brainwashing and unethical fundraising, which the church has always strongly denied. It has a number of celebrity followers, including Tom Cruise and John Travolta. A promotional video released by the church claimed the new HQ would provide "community programmes for the betterment of Birmingham". It claims to have had a dedicated following in the area since the 1980s. Plans to convert Pitmaston House met with some opposition when they were approved in 2013, although a local community group said its main worry was an increase in traffic.